Cut into thin slices. Keep aside. In a mixing bowl, add turmeric powder, red chilly powder, amchoor, cumin-coriander powder, salt and mix well. Spread the brinjal slices on a plate. Sprinkle the above masala powder and coat each brinjal slice with the masala. Heat 3 to 4 tbsp oil in a pan. When the oil is hot, place the brinjal slices on the pan. Allow the brinjal slices to cook on a slow flame so that it gets cooked well from inside. Flip brinjal slices and cook on both the sides. When the brinjal is cooked well on both sides, remove from the pan and serve hot. Shallow frying the brinjal slices take more time as compared to deep frying. For shallow frying, the brinjal should be cut into thin slices. 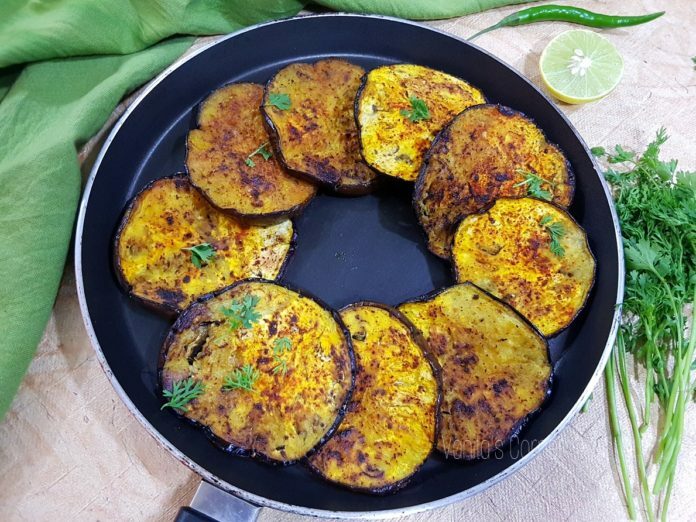 Traditionally, begun bhaja is made by coating the brinjal slices with only turmeric powder, red chilly powder, salt and sugar. However I have added amchoor and cumin coriander powder to make it more flavourful. 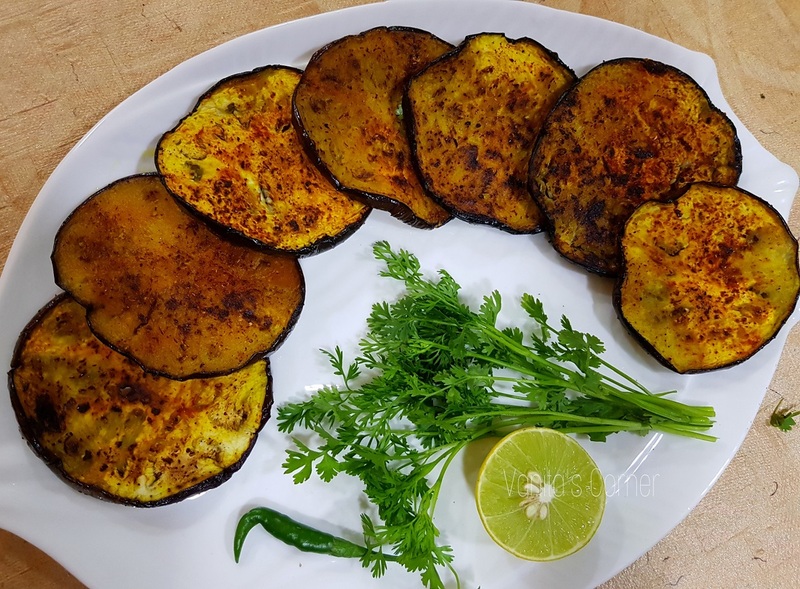 After coating the brinjal slices with the masala powder, they can be further coated with rice flour or wheat flour before frying.